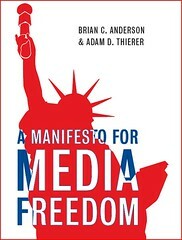 I’m pleased to announce the publication of A Manifesto for Media Freedom, which I co-authored with Brian C. Anderson of the Manhattan Institute. Brian serves as editor of Manhattan Institute’s excellent City Journal and he is the author of best-selling books like South Park Conservatives and Democratic Capitalism and Its Discontents. many people hate this profusion, and never more than when it involves political speech. The current media market, they charge, doesn’t represent true diversity, or isn’t fair, or is subject to manipulation by a small and shrinking group of media barons. They want the government to regulate it into better shape, which just happens to be a shape that benefits them. Doing so… would be a disaster, a kind of soft or not-so-soft tyranny that would wipe out whole sectors of media, curtailing free speech and impoverishing our democracy. In other words, instead of celebrating the unprecedented cornucopia of media choices at our collective disposal, many policymakers and media critics are calling for just as much media regulation as ever. We itemize these threats in our chapters and they include: efforts to revive the “Fairness Doctrine”, media ownership regulations, “localism” requirements, Net neutrality mandates, a la carte regulations, cable and satellite censorship, video game censorship, regulation of social networking sites, campaign finance-related speech restrictions, and so on. It doesn’t seem like much to ask until you realize how many people in Washington and academia today are calling for these various flavors of media regulation. Of course, it doesn’t help that media-bashing has always been a bipartisan sport. Indeed, depsite the fact that most of these efforts are lead by the Left, our book highlights how some folks on the Right are still guilty of joining some of these misguided regulatory crusades. Republican presidential candidate John McCain, for example, has sponsored “a la carte” mandates for cable and satellite operators and sponsored the draconian campaign finance law that will forever bear his name, McCain-Feingold. He has also proposed a follow-up law: McCain-Feingold II. Although it did not pass, McCain’s measure would have required broadcasters to run 12 hours of “candidate-centered and issue-centered programming” in the six weeks prior to primary and general elections — without giving broadcasters any control over those 12 hours (half of which would have had to run during prime time). The bill would have created a voucher system for the purchase of airtime for political advertisements, financed by an annual spectrum-use fee on all broadcast license holders. In sum, the legislation would have forced broadcast stations to pay a tax to the federal government that would in turn finance a pool of funds that politicians could turn around and spend to run ads on those very stations! Others on the Right have favored the Fairness Doctrine in the past, and more recently, some have joined the Net neutrality effort. And many conservatives have long been in favor of various forms of media censorship. The left seems certain that a media problem ails our society; it just can’t decide what that problem is. Some contend that real media choices are as limited or biased as ever, while others argue that our democracy is imperiled by too many media choices, making it hard to share common thoughts or feelings. What unites these two types of critics is their elitist presumption that they know what’s best for the rest of us. They would love to rewrite regulations to tilt the media in the direction they prefer; and if they are allowed to do so, what is shaping up to be America’s Golden Age of media could come to a sudden end. Some liberals suggest that even a new Fairness Doctrine wouldn’t be enough to correct a “structural imbalance” in the media marketplace. They want tightened ownership regulations, mandates ensuring “greater local accountability” over radio and TV broadcasters, and a significant ramping up of subsidies for public radio and TV stations. One leading leftist proposal would even force private broadcasters to fund public broadcasters! These proposals expose the left’s true goal: to regulate private media outlets comprehensively and drive out those owners who dare to offer right-leaning alternatives. Motivated by the naked desire for political control, a reactionary fear of the new, or genuine if misguided views on equality and fairness in the media, [these liberal media activists] threaten to enact regulations that will strangle or at least cripple this social development before it can begin to reach its potential. Those on the right are not free from these impulses, either. But they, as the prime beneficiaries of media abundance — of all the conservative and libertarian talk shows and websites that would suffer in a media landscape remade by the Democratic Party and liberal activists — should embrace, defend, and expand the freedom that made it possible. Anyway, if you care about free speech and media freedom, I do you hope you will consider giving the book a look. The main page for our book is here. And you can find it on Amazon here.